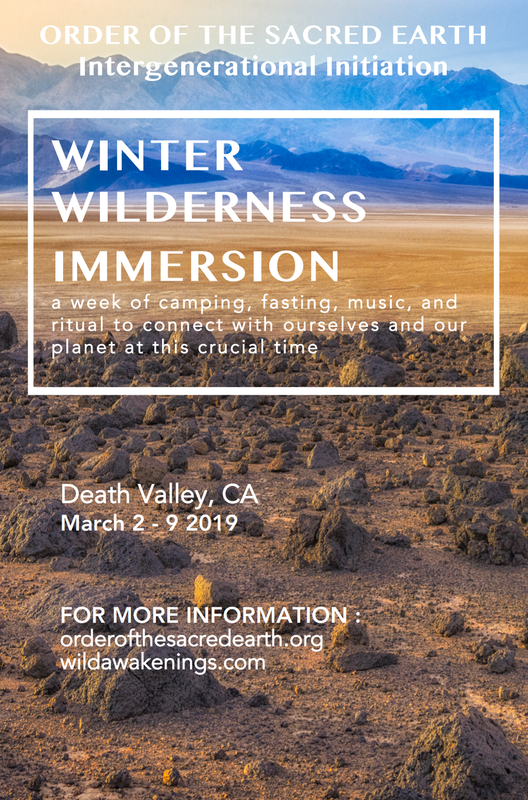 Skylar Wilson leads a week of camping, fasting, music, and ritual in the desert of Death Valley to connect with ourselves and the planet at this crucial time. 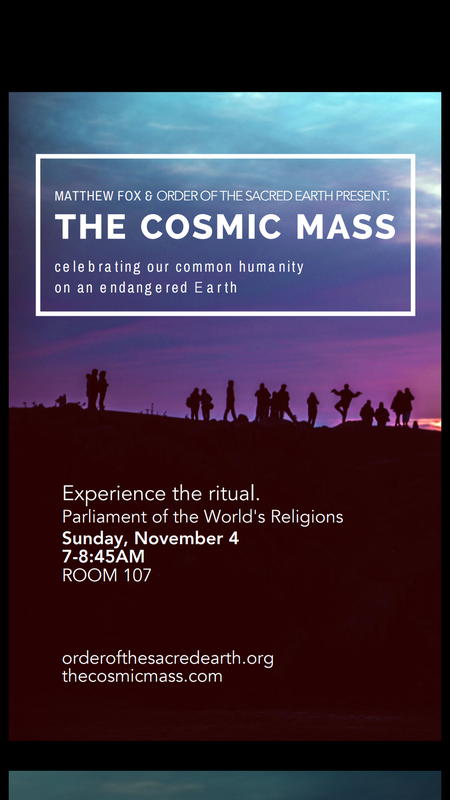 The Parliament of the World’s Religions hosts Matthew Fox in a Cosmic Mass with the theme “Our Sacred Earth.” Join in this full-consciousness worship experience affirming our deep Earth connection, based on the four paths of Creation Spirituality. July 27, 2018 (Fri), 7:00 p.m.
Join Matthew Fox, Skylar Wilson and Jennifer Listug for a Dialogue and Book Signing to celebrate the formal launch of their co-authored book, Order of the Sacred Earth. July 18, 2018 (Wed), 7:00pm – 9:00 p.m.
Join Rev. Dr. Matthew Fox, Skylar Wilson, Jennifer Listug, Broderick Rodell, Michelle Jordan and friends, Vladimir Cardema, and Lucia Lilikoi for a night of conversation, music, sound healing, and ritual. 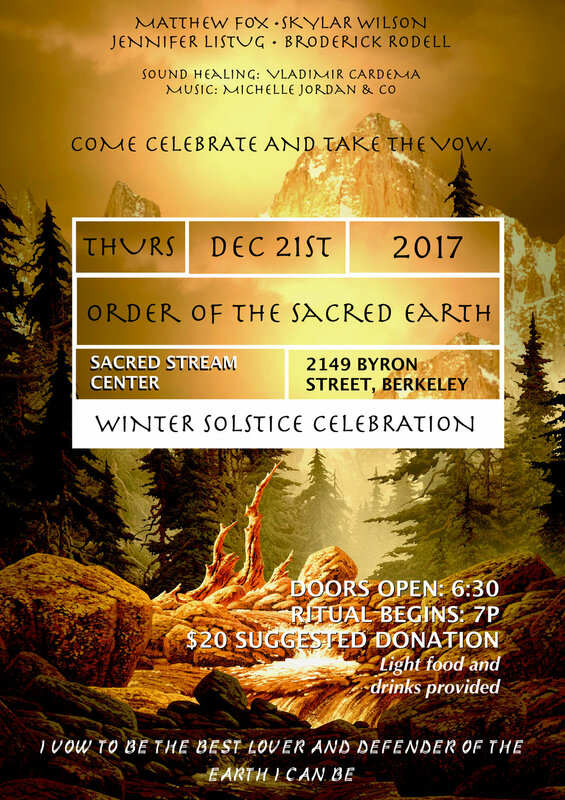 Come either as a vow-taker or as a supporter, online or in person at the inaugural event, on the Winter Solstice this year. The event will take place at the Sacred Stream Center, 2149 Byron Street, Berkeley, CA, with doors opening at 6:30 p.m. Light food and drinks will be served, and books will be available for purchase! Can't make it to the real-time event? Join us online: we will be live-streaming it all on our website: orderofthesacredearth.org. Come in person, or design your own ritual, alone or with friends, to celebrate your commitment to life wherever you are! Pardes Levavot: A Jewish Renewal Congregation in Boulder, Colorado, as they come together in prayer and reflection for a joint ecumenical service with Rev. Matthew Fox.